In April, Meaghan from Messy Buns and Roses was my featured blogger. You can read that post and see other past featured blogs under the "blog of the month" label! Being my blog of the month gets you a designated blog post, a sidebar button, and a mention on my Twitter account. The sidebar button stays up all month long. I don't believe in necessarily making bloggers pay for advertising and I'd much rather show you blogs that I really enjoy reading. And I hope you end up enjoying them too! 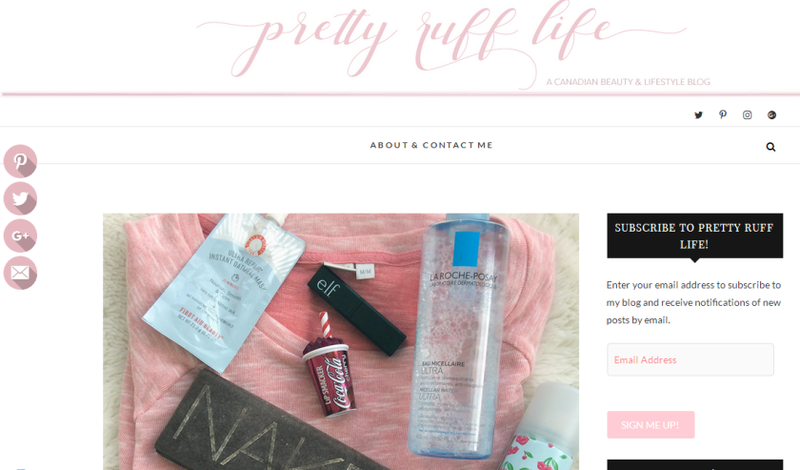 This month's featured blogger is Nicole from Pretty Ruff Life! Nicole is so incredibly sweet. She's always someone who leaves the nicest comments on Instagram and always comments back. She focuses on beauty and lifestyle posts and if you follow her on Instagram, be prepared to see her adorable pup. She's going through a major decluttering of her makeup stash right now and saying why she's letting it go, which is always interesting! Feel free to let her know I sent you if you check out Nicole's blog.